When we were in Japan, we were amazed at how many different flavors of Kit-Kat candy bars were out there. Green tea, strawberry, white chocolate, red bean...I only wish we had them all in the U.S. Although I can't read this Japanese Kit-Kat site, it gives you an idea of the cool variety they've got over there. Lucky them! My boyfriend imported me a bag of the green tea ones for my birthday last year; they were amazing. have you tried visiting some of the Asian markets around Seattle? I'm not familiar with your city, but I hear our San Francisco Bay Area and Seattle have parallels on having a big Asian community. I'm sure some of the bigger markets, such as 99 Ranch Market or even the smaller mom & pop stores (in what I would assume in the area of Japan/China-towns) would probably stock the "Asian flavours" of Kit-Kats, Pocky, et al. 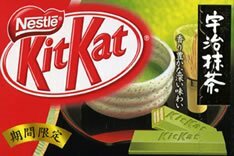 I've seen the green tea Kit-Kats in the bigger asian market stores down here. Good luck! I've had the pleasure of eating many of the Japanese Kit Kats. Grape seems to be the most elusive. There's a Kit Kat page on Wikipedia with a pretty extensive list of flavors. I've seen orange, strawberry and milkshake here in the southern US.